Images from the series played at Cady Arena in Oxford on Nov. 20-21, 2015. All photos by Cathy Lachmann. OXFORD, Ohio – Miami seemed to find every conceivable way to record non-wins the last two weekends. The RedHawks got blown out, then gave up the tying goal in the closing minutes and the winner in overtime last weekend. 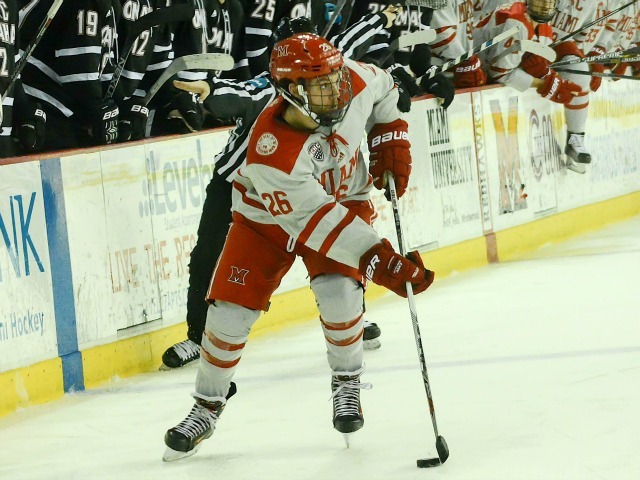 Friday it was a mid-third period goal against that ultimately induced a tie, and Saturday another overtime winner allowed in a 3-2 loss to Nebraska-Omaha at Cady Arena. Quick thoughts and observations on the finale and then we’ll look ahead, since the can’t-close-out-wins angle has been beaten to death, both on the ice and in writing here. 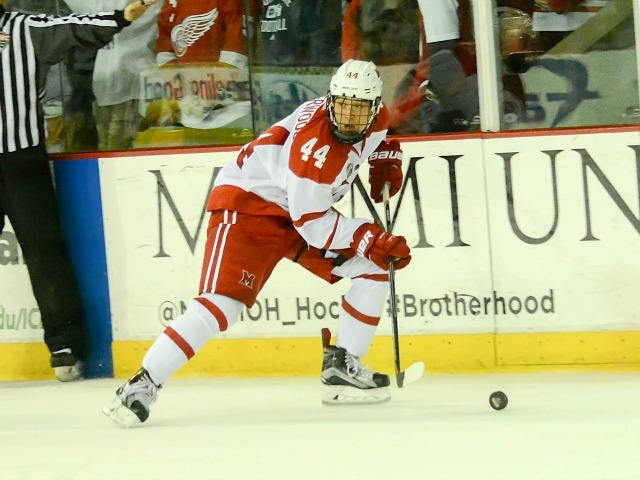 – One has to feel back for sophomore defenseman Scott Dornbrock, who played so well all weekend before the somewhat unlucky decisive goal in OT went in after he couldn’t hold the puck in the zone and got beaten the outside. Whether he should’ve played that more conservatively or not, he didn’t deserve that fate to end the weekend. – Once again, Miami looked solid overall but didn’t do enough to win. The problem on this night was finishing, which has been a recurring problem. Sometimes the puck just won’t find the net, but when it happens on many nights it makes one question the team’s shooting accuracy. 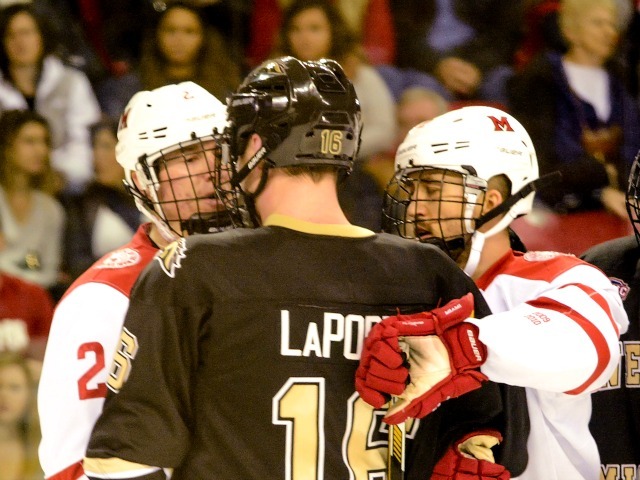 – Preface by saying UNO found a way to earn the tie Friday and the win Saturday, the following is in no way a sour grapes commentary, but the officiating was flat-out brutal this weekend, especially the finale. Sean Kuraly was assessed a boarding major that resulted in the second Mavericks goal, and no one in the building thought it warranted five minutes. The linesman actually made that call, which neither referee saw or thought was worthy of a penalty, which makes that even tougher to stomach. Defenseman Louie Belpedio was assessed a tripping penalty for a legal check, and many obvious called against both teams were missed while other non-calls were whistled. And let’s not get Josh Melnick getting called for breathing on a player in the first minute of overtime. Most fans thought we had seen the last of Brian Aaron when the CCHA folded, but there he was in Oxford this weekend, blowing call after call again. – On a more positive note, Anthony Louis and Kiefer Sherwood scored the RedHawks’ goals and are starting to pile up points. Louis always seems to start slowly before lighting up the scoresheet the second half of the season, and Sherwood’s 2014-15 USHL campaign indicates good things are ahead for the freshman, who is getting better every game and is becoming an exciting player to watch. Seeing players improve is one of the biggest thrills of watching a college hockey team regularly, and his evolution is fun to witness. Now a look at where Miami goes from here. 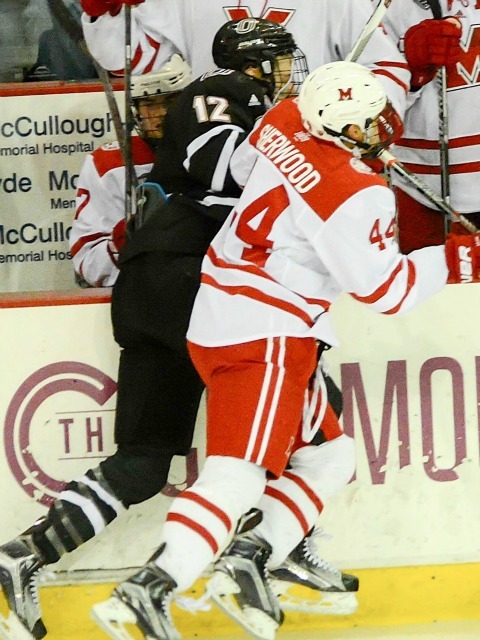 Physically, the RedHawks go to Colorado College, which is 0-12, for a two-game series in two weeks. The term ‘must-win games’ is way overused, and that’s not really the case here, but a sweep of those contests and the resulting six points would be extremely helpful in getting the team back on track. Anything less and Miami will head into 2016 below .500 and likely in the bottom half of the NCHC standings with every other league team having games in hand over the RedHawks. The latter part of the last sentence is important: Miami has logged eight league games. Everyone else has played six except Denver, which has just four in the books. Tied for fifth with 8 of 24 possible points is bad enough, and now the RedHawks will play CC in two weeks then just two more NCHC games until Jan. 22. Some context: Last season it took 41 points to earn home-ice advantage for the NCHC Tournament and 50 to win the Penrose – the No. 1 seed and a home date with Colorado College in the first round. Miami has eight points in eight games and would need 33 more to reach the 2014-15 threshold for home-ice. That’s 11-5 or the equivalent in tie/3-on-3/shootout points against a murderer’s row conference schedule. Doable? Certainly. Uphill climb. Certainly again. To reach 50 it would take a 14-2 finish. Not happening. And that’s a knock on Miami, more of a statement about how tough it is to almost run the table in this league, even for a top-five team, which the RedHawks are not at this point. The good news: The toughest series are over. No more North Dakota and Miami already played at St. Cloud State. SCSU does come to Oxford, and the RedHawks go to UNO in late January, but the other NCHC games remaining for MU are two at home vs. Denver, two at Western Michigan and four each vs. Colorado College and a Minnesota-Duluth team that is 5-5-3 with a losing NCHC record. To simplify: Miami needs to start winning games consistently. FORWARDS: C. Thirty-two shots overall – 25 by this group – is pretty good, especially considering Miami was shorthanded for over 14 minutes, but the finishing thing has become a major concern. The goals were both great, and overall this corps played well defensively, but it’s really time to start scoring goals. Louis became the third Miami forward to score his third goal this season in this game, and we’re 14 games into the season. 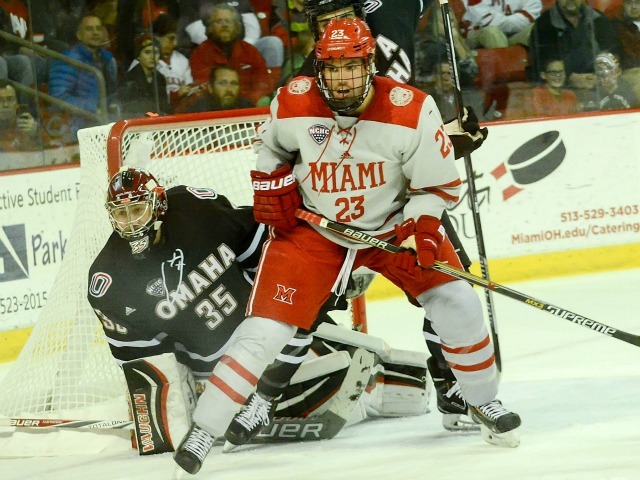 DEFENSEMEN: B. Miami held UNO to 25 shots, and the first two goals were not at all on this group. Another workmanlike effort from the D-corps. GOALTENDING: C+. It was sort of a similar game to Friday for Ryan McKay – one bad goal (the first one, off a huge rebound) and a solid showing otherwise against not a lot of high-percentage shots. It was another contest in which he certainly didn’t lose the game for Miami, but he didn’t win it either. 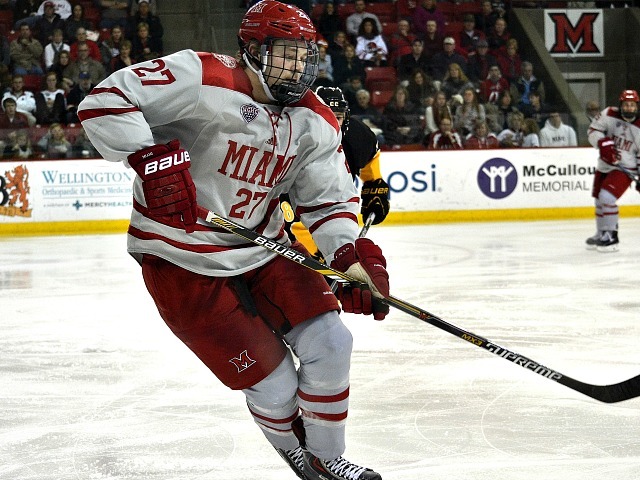 Miami defenseman Colin Sullivan (photo by Cathy Lachmann). LINEUP CHANGES: It was the same 19 as Friday. Forward Zach LaValle was still out of the lineup with a presumed upper-body injured, forward Michael Mooney was scratched, and defenseman Colin Sullivan sat again. Two thoughts: 1) Can Sullivan play forward? He’s super experienced at the college level, and let’s face it: After the top two lines there’s not much offensive contribution anyway (someone else credible mentioned the possibility this weekend). With seven talented defensemen, it’s tough to decide who sits each night, but you hate to see someone who would be in the lineup every night for 80 percent of NCAA team benched for long stretches. And 2) the smart money is on Jay Williams seeing a game in net in two weeks since McKay seems to play better when he doesn’t play numerous consecutive games and the games in two weeks will be at a high altitude. 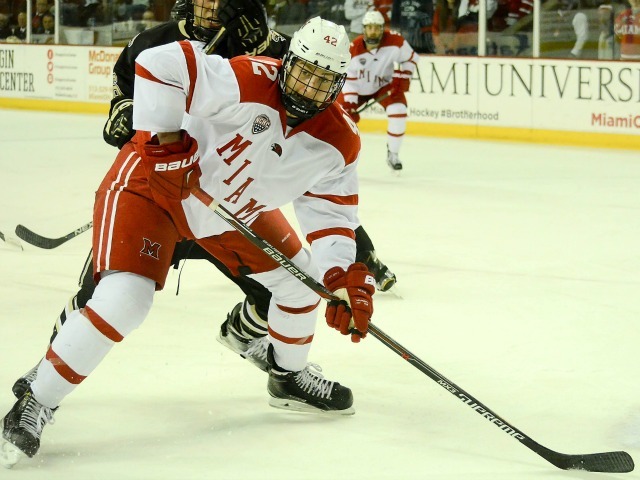 OXFORD, Ohio – One-goal games decided late continue to haunt Miami. 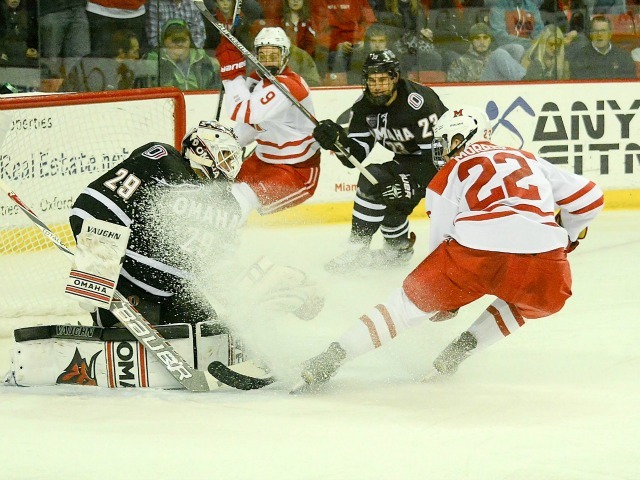 The RedHawks lost their second overtime game in eight days as they fell, 3-2 to Nebraska-Omaha at Cady Arena on Saturday. Miami also settled for a tie on Friday despite leading the first half of the third period. The loss snapped the RedHawks’ five-game unbeaten streak and sent them to a season-worst two games below .500. Miami never led in the series finale, and the Mavericks jumped on the board just eight-plus minutes into the game. A David Pope rip from the top of the left faceoff circle was stopped by RedHawks senior goalie Ryan McKay, but the rebound came to the opposite side, and Austin Ortega slammed it home. After a major penalty was assessed to Miami senior center Sean Kuraly, Brian Cooper intercepted a clearing attempt by senior forward Kevin Morris and banged it home 3:51 into the middle frame, making it 2-0. The RedHawks battled back with a pair of late goals in the second period to tie it. Miami forward Anthony Louis (photo by Cathy Lachmann). Junior center Anthony Louis backhanded one top shelf from the slot with 3:42 left in that stanza, and freshman forward Kiefer Sherwood ripped a shot just under the crossbar with 43 seconds left to even it heading into the second intermission. 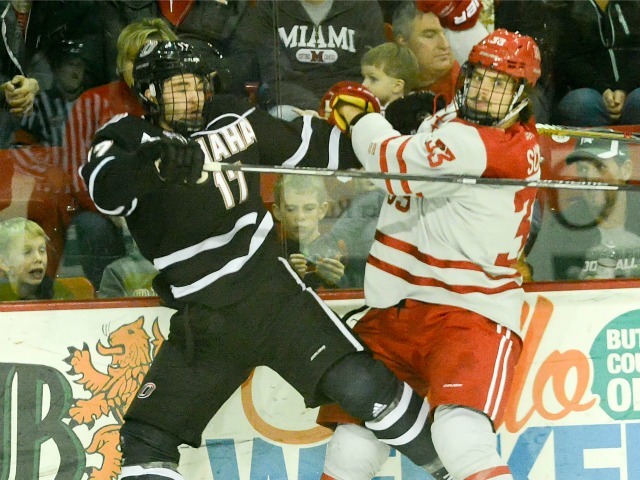 But after a bouncing puck eluded Miami sophomore defenseman Scott Dornbrock at the blue line, UNO’s Tyler Vesel skated around Dornbrock and fed Jake Rudolph for the game winner with 1:46 left in overtime. The RedHawks are now 0-2 in the extra session this season. Louis finished with a goal – his third in five games and his second in of the weekend – and an assist, giving him seven points in six games (3-4-7). Sherwood ended the weekend with a goal and two helpers, both of which came on Friday. UNO spent over 14 minutes on the power play, compared to seven for Miami. The RedHawks are now tied with Minnesota-Duluth for fifth place in the NCHC with eight points, and Miami has played more league games than any team in the conference (8). This was the final home game of the calendar year for Miami, which is off next weekend and wraps up its 2015 schedule with a pair of games at Colorado College on Dec. 4-5. NOTE: My apologies on not writing about the recent away games. The truth is with high school football on Fridays and Saturdays and excruciating early Sunday hours, I missed the St. Cloud and North Dakota series. With preps winding down I’ll be able to watch the team on the road the remainder of the season. 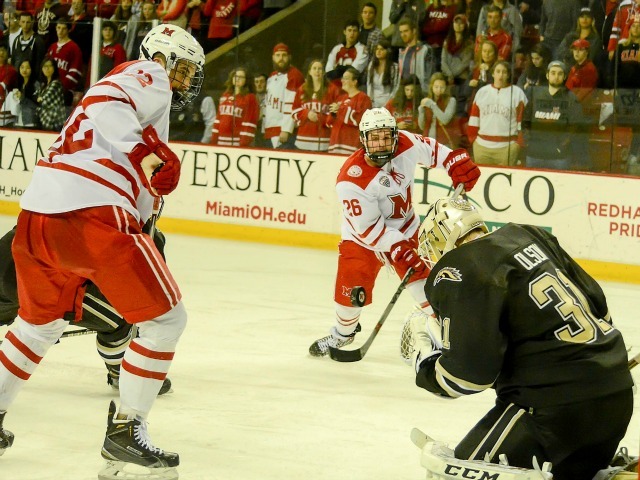 OXFORD, Ohio – Four league points have escaped Miami in its last two games because of three third period and overtime goals against. Obviously that is a troubling trend, as the RedHawks and No. 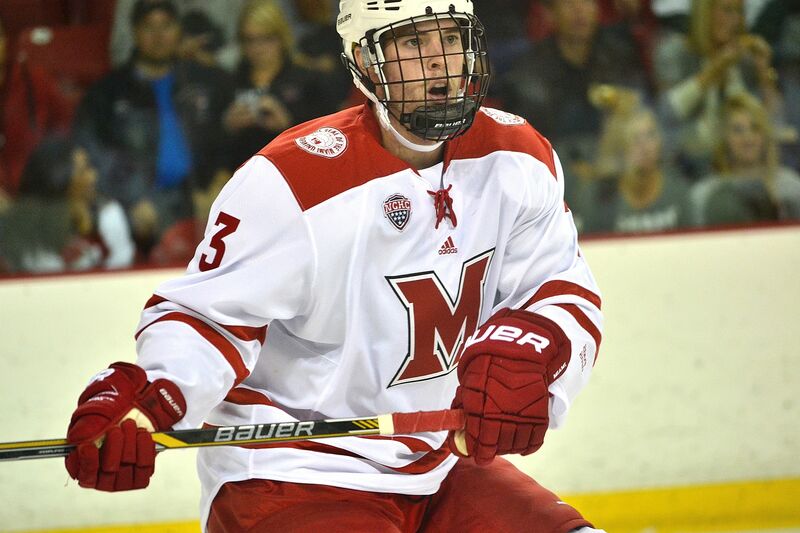 6 Nebraska-Omaha played to a 3-3 tie at Cady Arena on Friday, although Miami did manage to pick up a second point with a 3-on-3 goal by sophomore defenseman Louie Belpedio. 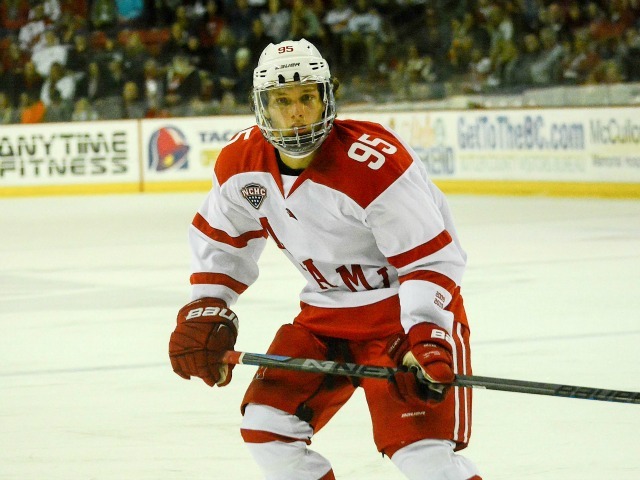 Last Saturday, the RedHawks led late but surrendered an extra-attacker goal and another in overtime in a 4-3 loss at North Dakota. Disturbing is that this is a veteran team, especially on the back end. Miami’s goalies are both seniors, and its defensemen are senior-senior-senior-junior-sophomore-sophomore-freshman. 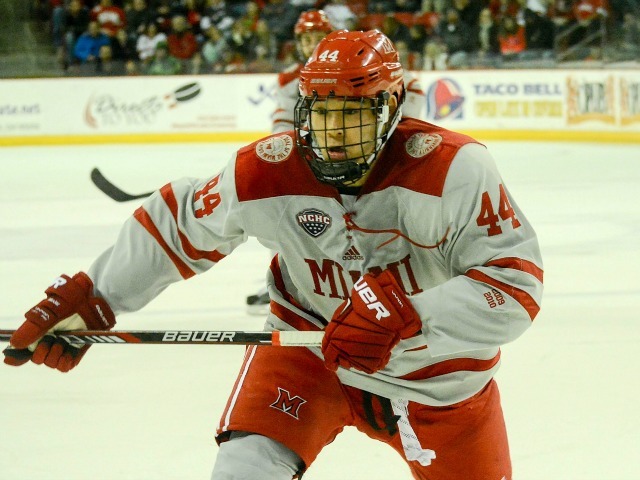 The forwards are admittedly young, but are the freshmen up front really the root of this team’s inability to close out games, or for that matter the RedHawks’ sub-.500 start? Jack Roslovic and Josh Melnick are the only two consistent scorers on this team right now, and the other regular rookies in the lineup are Ryan Siroky, Kiefer Sherwood and Zach LaValle, none of which have been a burden to Miami’s lineup and all look like candidates to have solid careers in Oxford. Roslovic does carry the puck too much and the results sometimes aren’t good, but he’s 18 and he has eight of the team’s 28 goals this season, so the gain of him in the lineup is still a major positive (to further that point, he and Melnick have 13 of the team’s goals, nearly half). Lack of scoring was a major factor the first 11 games – still is overall – but the RedHawks scored three goals in their last two games and have an 0-1-1 record to show for it. The frustrating thing is that it hasn’t been a consistent weak link – poor goaltending, a shallow defense pool, forwards that don’t play both ways, a meager penalty kill, etc. (Miami has been good overall in all of those areas) – but the past two games, opponents are making big plays and Miami isn’t. I’m sure I’m in the minority, but a 6-2 loss last Friday at North Dakota bothers me a lot less than a 4-3 overtime loss the next night or a blown late lead again this Friday. 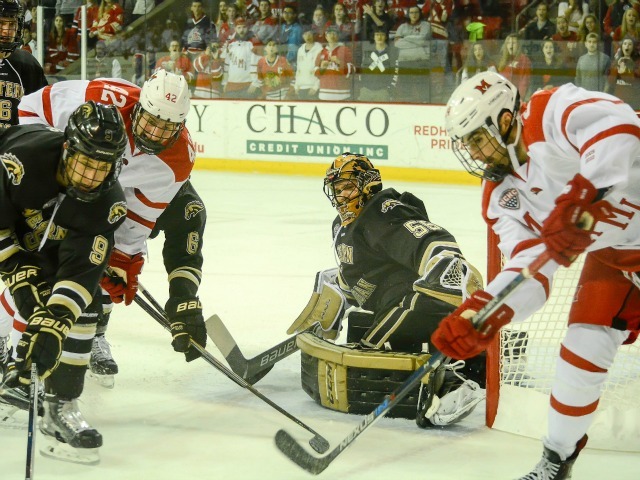 Teams have bad nights, heck look at Western Michigan’s 11-1 loss at St. Cloud State last week. But the Broncos beat this UNO team twice on the road days before. 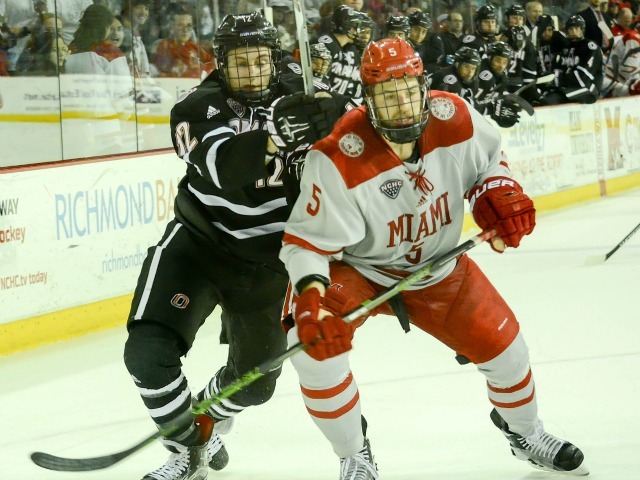 In a league as competitive as the NCHC, it’s the close games that are so important, and losing points the way Miami has is tough to watch, especially with a team like the RedHawks that everyone knew was going to depend on a veteran presence on defense and in net, meaning lots of low-scoring close games. 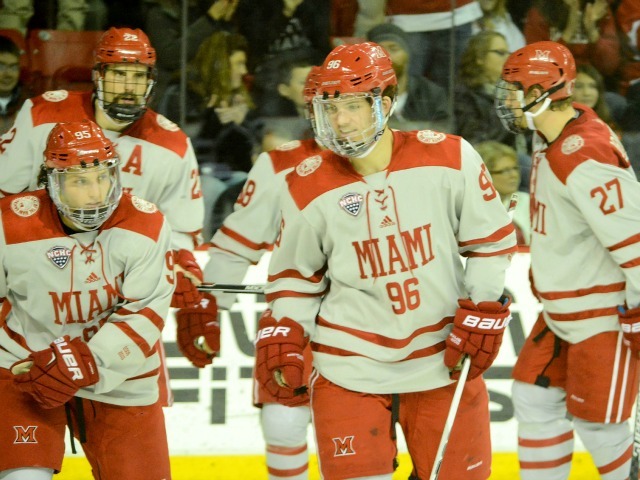 Miami did a solid job of winning those tight games against WMU two weeks ago, but against stiffer competition its last two games, the RedHawks have not measured up in the clutch. The result: Four lost points in those contests. Really it’s been a six-year trend, Miami snatching defeat from the jaws of victory too many times, and on a team that will play in a lot of 2-1 and 3-2 games the rest of this season, it just can’t afford to lose 4-3 the way it has the last two games. 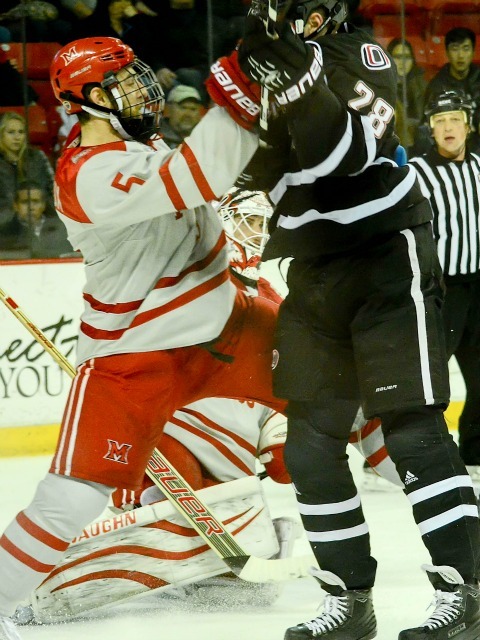 The ultimate result was a tie on Friday, but the RedHawks played very well overall (maybe not so much the third period) against one of the best teams in college hockey. Sean Kuraly didn’t score but looked a lot more confident than he had earlier in the season. Like Kuraly, Belpedio has not played his best to start 2015-16 but was impressive in this game. Grant Hutton is really stepping into the shut-down defenseman role. Sherwood seems to get better every game. The Crash Cousins were entertaining to watch, throwing around their combined 500 pounds of muscle. 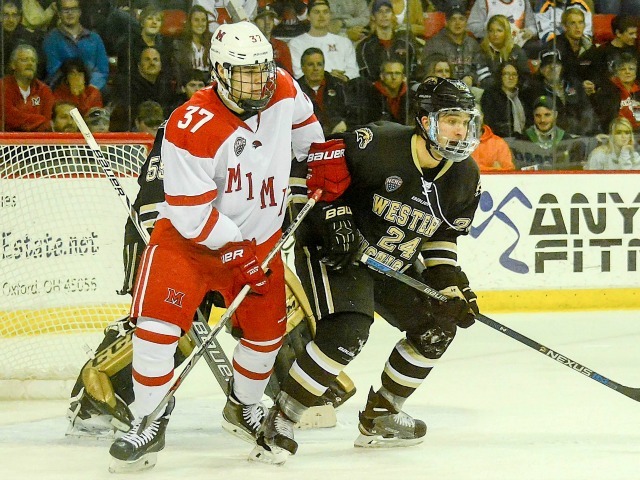 Taylor Richart, Chris Joyaux and Matthew Caito are playing their best hockey on the blue line in their senior seasons. 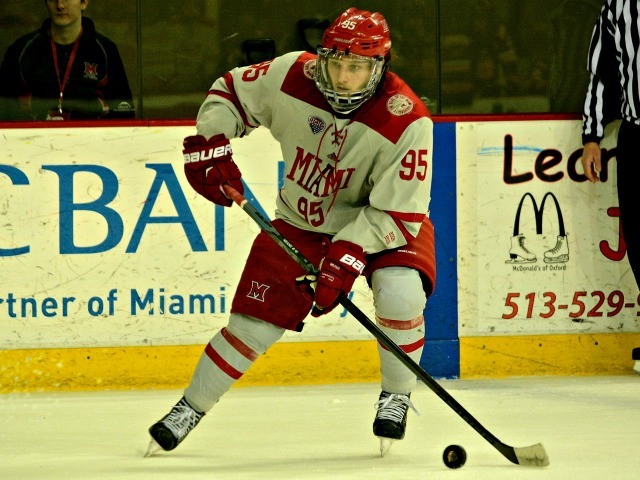 Miami defenseman Scott Dornbrock (photo by Cathy Lachmann). Defenseman Scott Dornbrock played arguably his best game of the season. The cliché about the process vs. the result should not be ignored, but still the process and simply playing well don’t earn teams NCAA Tournament berths, so Miami needs to still evolve and also win more. – How about the power play? The RedHawks are 7-for-17 on the man advantage their last five games with at least one PPG in each. That’s even more impressive considering the caliber of Miami’s recent opponents and how young its top unit is. Actually both units. The RedHawks are now 24.0 percent on the power play. 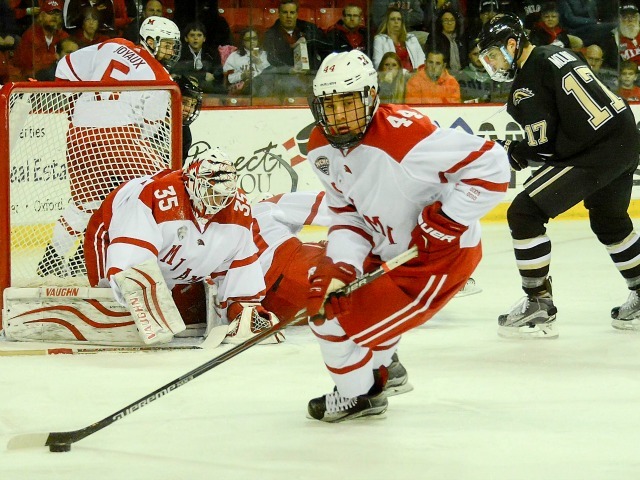 – The PK is now 44 of 46 (95.7 percent) after another shut-down effort last night. – So if Miami has an offense problem and has 12 power play goals, that must mean the team isn’t scoring at even strength. 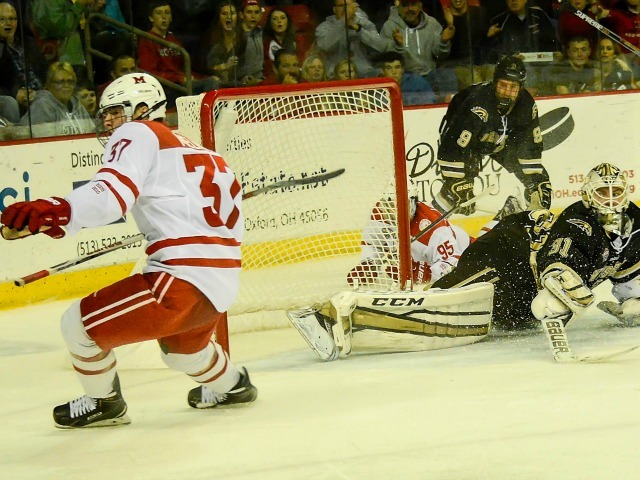 The RedHawks have 16 even-strength goals in 13 games, or 1.23 per contest. That’s really dreadful. – Really hate to play the Debbie Downer role, but Miami celebrated the goal that isn’t really a goal by Belpedio as if it had won the Stanley Cup when in reality that goal likely means absolutely nothing. That is, unless the RedHawks move up a seed because of a one-point difference in the conference standings (in the bizarre coincidence department, the only two teams that finished a point apart in the NCHC standings last season were Miami and UNO, with the RedHawks taking the two seed by a point over the Mavericks). One more time: It was a tie. And when a team is a game below .500 like Miami is and has a chance to beat one of the best teams in college hockey but squanders a late lead, it’s not a good night. And really the overwhelming majority of fans just don’t get it, and while the 3-on-3 is great, minimizing shootouts is great (I would argue eliminate them, but that’s for another time), both are confusing and ultimately pointless from a standings perspective, no pun intended. I get where the league was going with this, I really do, and it’s an admirable goal to have a winner and a loser each night. But when the extra action has so little meaning and confuses fans, it isn’t worth it. So to recap: Belpedio scored but doesn’t get credit for a goal, Miami won the 3-on-3 but is credited with a tie (the scoreboard operator doesn’t get it either – erroneously listing the score as ‘4-3’ after Miami’s ‘goal’) and the RedHawks get an extra point in the league standings which has no impact on the infinitely more important NCAA record. Got that? While uptown briefly last night multiple people saw our Miami hockey gear and asked what the RedHawks did. There was no way to explain this without confusing people. Hockey is already a tough enough game to pick up for the casual fan. 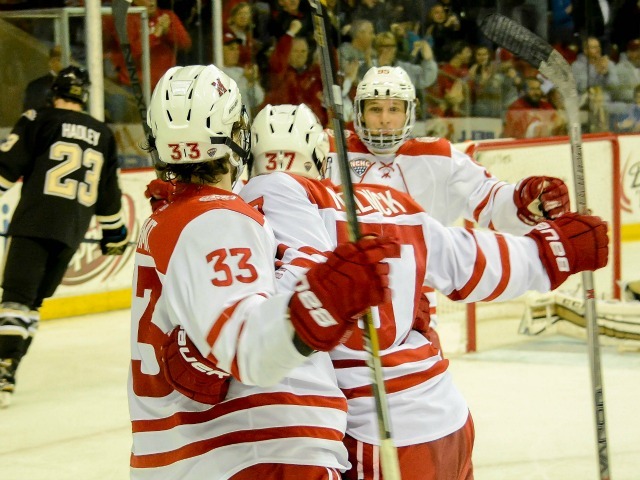 The well-intentioned NCHC has made it even tougher. In a perfect world, the NCAA would adopt the NCHC’s model so that post first-overtime play would have real meaning, but that body has made it clear that it does want games to deviate from 5-on-5 action at any point to decide games. FORWARDS: B. Grades for all positions were tough to give in this game, since overall the team played very well but the result was a tie. Pretty much everything that needed to be said about this group was mentioned above. 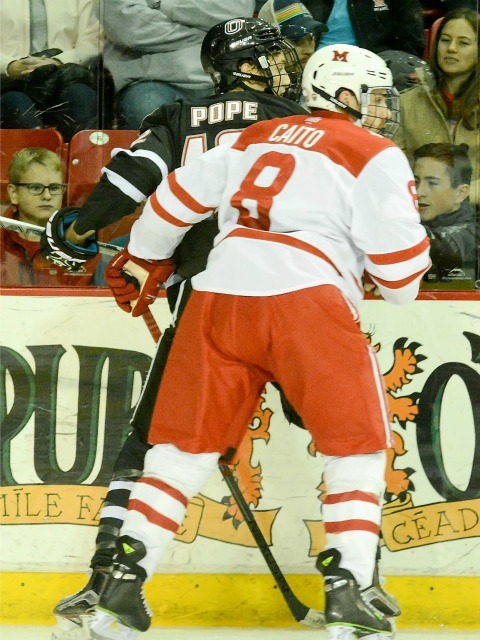 DEFENSEMEN: B. Caito had a sweet goal and almost set up another, except Roslovic fanned on a cross-crease pass. Dornbrock really took a step forward, and Belpedio looked like Version 2014-15, which is a major compliment. This corps held UNO to 25 shots and recorded a goal of its own. Good effort by this group. GOALTENDING: C-. Ryan McKay probably should’ve had the third goal, and he didn’t face a ton of difficult shots, other than the two that went in prior. LINEUP CHANGES: LaValle is out with a suspected upper-body injury, and it’s unclear how long he’ll be out. Junior Devin Loe took his place in this game. Colin Sullivan was once again the odd man out on defense, sitting for the fourth time in five games. OXFORD, Ohio – For the second straight game, Miami held a late lead but was unable to close out a win. At least this time the RedHawks salvaged a tie. Miami and No. 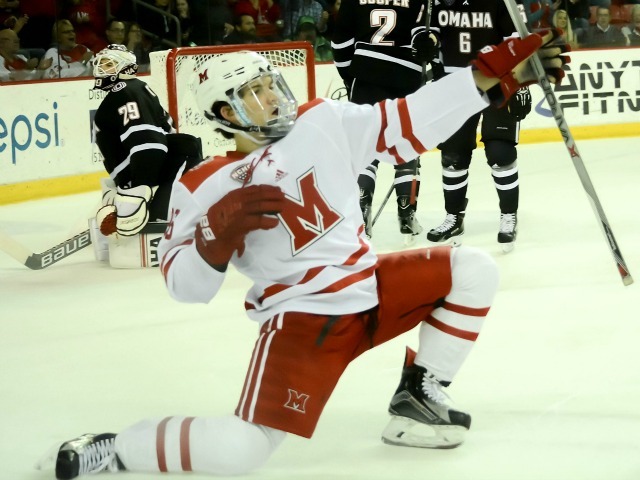 6 Nebraska-Omaha skated to a 3-3 tie at Cady Arena on Friday, as the Mavericks’ Austin Ortega scored the decisive goal with 10:10 remaining to force overtime and the eventual stalemate. 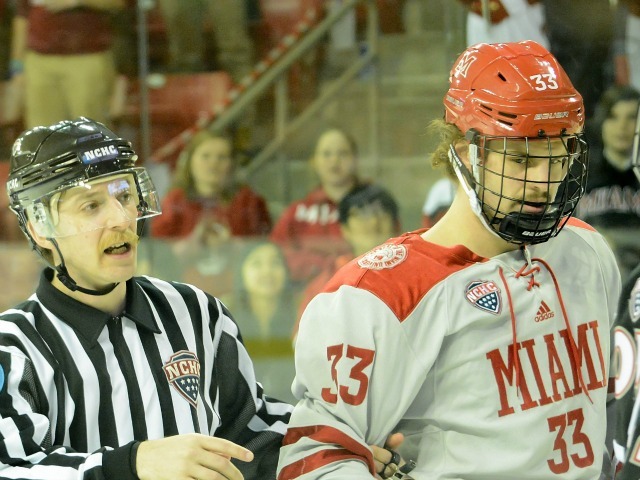 RedHawks sophomore defenseman Louie Belpedio scored early in the second overtime which earned Miami a second point out of a possible three in the NCHC standings. In its last game, MU squandered a 3-2 lead in the closing minutes and ended up collecting zero points after allowing the winning goal in overtime at North Dakota. The game was scoreless after one period, but five of the game’s six goals were netted in the middle frame. A rebound shot by Fredrik Olofsson opened the scoring 47 seconds into the second stanza, giving the Mavericks the lead. Miami freshman forward Josh Melnick centered a pass from behind the boards to junior forward Anthony Louis, who beat goalie Kirk Thompson 3:22 into the period. Tyler Vesel put UNO ahead shorthanded just two minutes later, and RedHawks senior defenseman Matthew Caito wired a shot through traffic from the blue line on the same Miami power play 27 seconds after the Mavericks’ go-ahead goal to tie it at two. Miami’s Jack Roslovic celebrates his go-ahead goal late in the second period (photo by Cathy Lachmann). RedHawks freshman forward Jack Roslovic slammed home a bad-angle shot from the side of the net to give Miami its only lead of the game, 3-2 at the end of a power play with 2:35 remaining in the middle period. But Ortega’s equalizer extended the RedHawks’ winless streak to three games. Miami did end up with several excellent scoring chances in overtime, but Thompson shut the door each time. 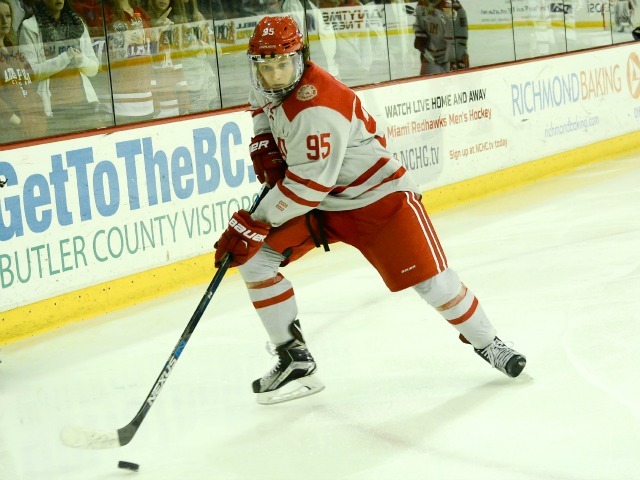 Roslovic ended up with a goal and an assist, his third straight two-point game, and freshman forward Kiefer Sherwood picked up a pair of helpers. 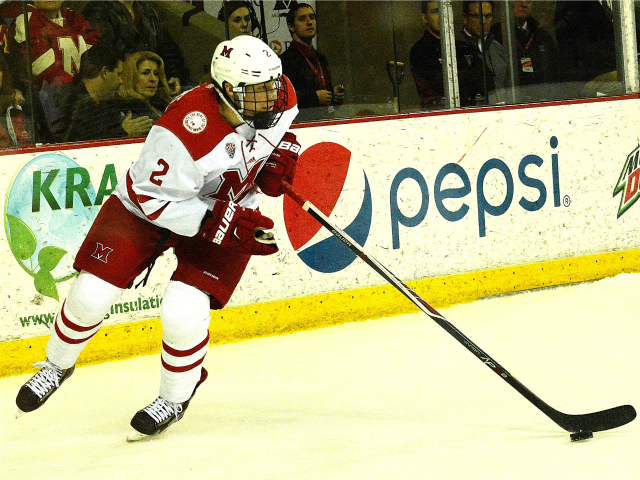 Melnick has also recorded points in three consecutive contests (2-2-4). The RedHawks are in fourth place in the NCHC with eight points but has logged more conference games than any other team in the league (7). Miami did extend its home unbeaten streak to five games (3-0-2). The series finale is at 7:05 p.m. on Saturday as the RedHawks play their final home game of 2015. 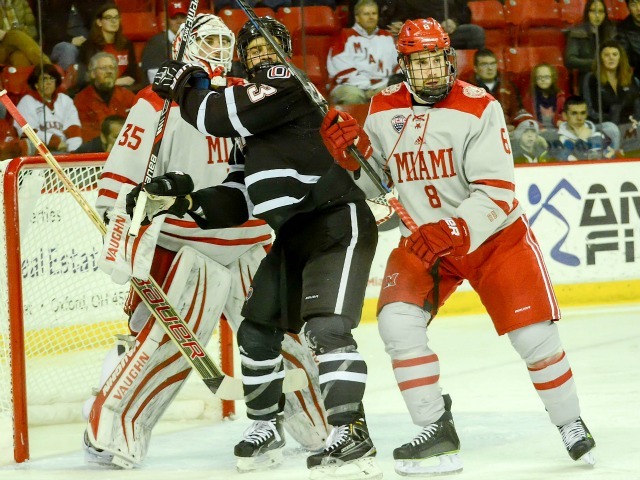 OXFORD, Ohio – Miami’s first NCHC series of the season did not go well, and the results reflected that – two losses at St. Cloud with one goal for, six against. 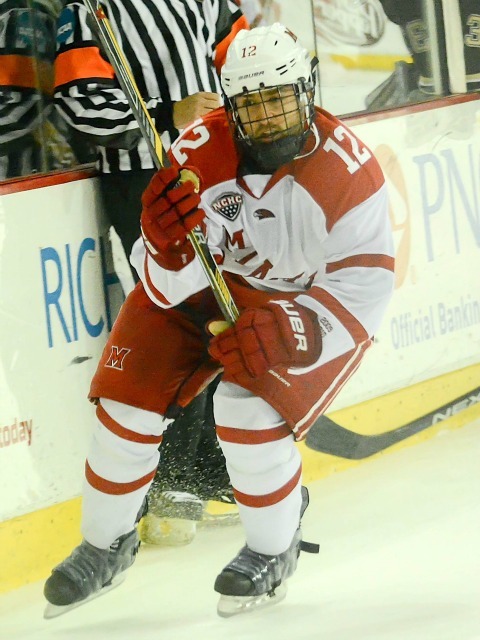 The RedHawks’ follow-up series, its first conference games at Cady Arena, were a marked improvement, with both ending in 2-1 wins over Western Michigan, including a victory in the second game on Saturday. From a statistical perspective, Miami went from tied for last in the league to basically the middle of the pack. Even through MU is in a six-way tie for first, Denver, North Dakota and St. Cloud State have only played two league games and are 2-0. Most importantly, from a getting-ready-for-bigger-challenges-ahead vantage point, even more good came from these games. 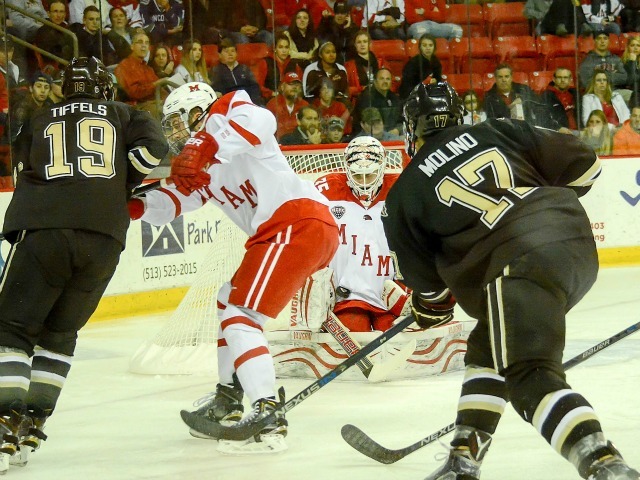 Defensively, Miami gave Western Michigan (4-4-1) almost nothing to shoot at all weekend, and the few times it did, Ryan McKay stopped almost everything he saw. 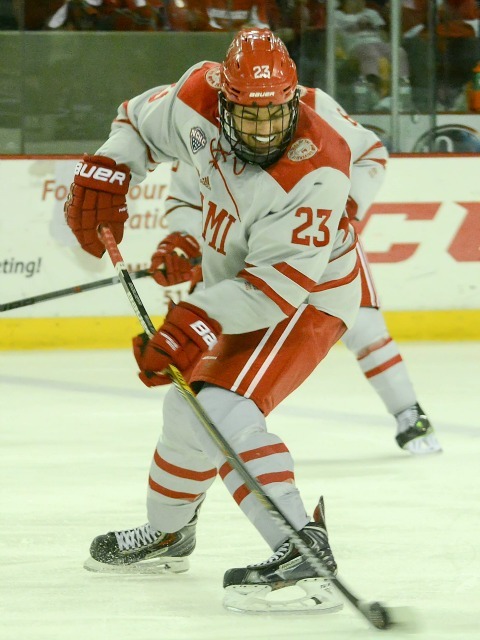 Offensively, the RedHawks were able to possess the puck in the offensive zone for long periods of time and get numerous looks at the net, even against a team that is outstanding at preventing teams from finding shooting lanes. And the Broncos are a physical, play-over-the-line at times group, and with one early exception, Miami was able to avoid dumb retaliatory penalties. And Western Michigan is well coached by Andy Murray, who spent 10 years as a head coach in the NHL, and this team is much better than in 2014-15. But the RedHawks were still able to escape with a couple of close wins and were able to close out games both nights, which has been an issue at times in recent years. Now Miami faces an even tougher test than St. 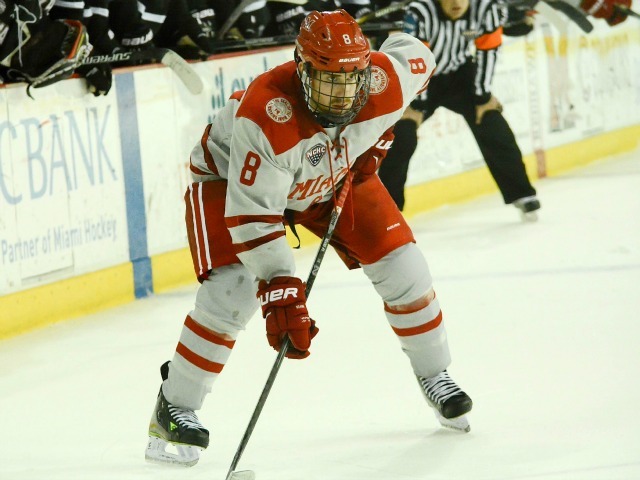 Cloud State – a pair of games vs. North Dakota in Grand Forks. At least the RedHawks have momentum heading into next weekend. 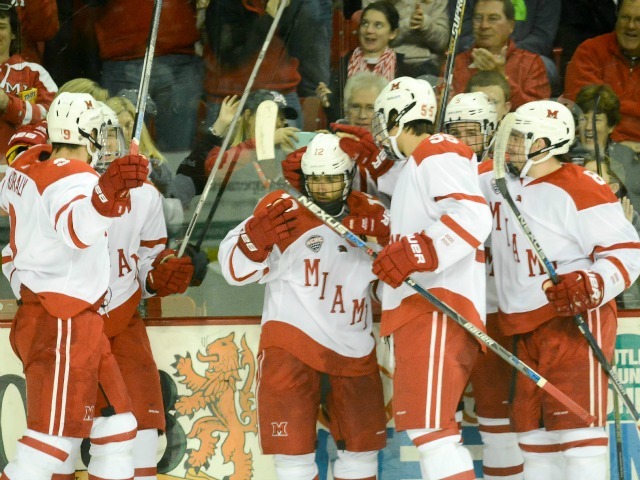 Miami’s Anthony Louis scored his first goal of the season on Saturday (photo by Cathy Lachmann). – Getting goals from Alex Gacek and Anthony Louis could be a huge boost for an offense that is struggling to get scoring from anyone. Gacek is playing the best hockey of his career, and Louis tends to start slowly and pile up the points when he gets going. It was Gacek’s second goals of the season, and the first (!!) for Louis. – In the final minute, there was a faceoff at center ice, and right before the puck dropped Sean Kuraly skated back and formed an impromptu huddle with Miami’s other four skaters. It was immediately broken up by the officials but may have been a first in hockey. Hey, we are well into football season. 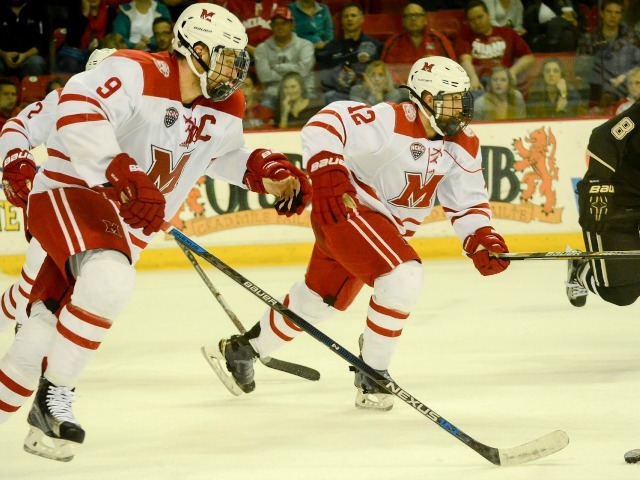 – Freshmen Ryan Siroky and Kiefer Sherwood haven’t been flashy, but the linemates seem to be getting better every game. Twice Siroky won offensive zone faceoffs straight back to Sherwood for a shot just inside the blue line. They both work incredibly hard on the ice, and it’s going to be fun watching them develop the next 3½ years. – McKay moved into solo control of eighth place all-time on Miami’s wins list with 35. He is one away from creating a three-way tie with Mark Michaud and teammate Jay Williams. – With a 2-for-2 night on the penalty kill, the RedHawks are now 34 of 35 for the season (97.1 percent) in that area. They have not allowed a power play goal in eight games. FORWARDS: C+. They controlled the action for a good portion of the game, but this corps still isn’t scoring as much as it should. While the defensemen and McKay get the majority of credit for keeping the puck out of Miami’s net, this group helps in that area as well. Gacek, Kevin Morris, Justin Greenberg, Josh Melnick have done a great job of shutting down opposing offenses and are also a key reason for the PK percentage north of 97 percent. Other than Jack Roslovic and Melnick, that scoring thing is still an issue overall for this team, though. 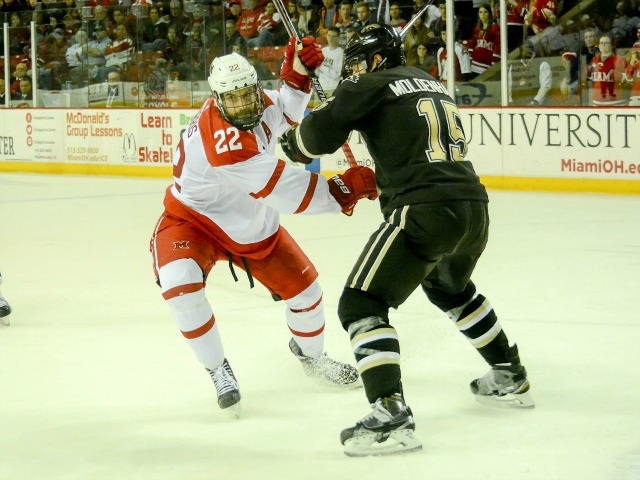 DEFENSEMEN: A. WMU finished with 20 shots on goal, and not too many were quality. Scott Dornbrock tried to clear a puck that hit a Broncos skate, and Western Michigan went in to score its only goal. WMU had an outstanding tip that McKay had to stop as well, and those were two of the only great scoring chances the team had. No one has been really flashy among this group but as a unit they are really tough to play against. GOALTENDING: A. The only goal was on a very good shot. McKay made an outstanding save on the aforementioned redirect and was generally really solid overall. He stopped 19 of 20 shots and is having an excellent start to his senior season. LINEUP CHANGES: None. Coach Enrico Blasi went with the same 19 as Friday. Normally he changes personnel pretty regularly at this point of the season and settles into a regular lineup in January or February, but he seems to feel comfortable with this group. Miami only has three extra skaters, and it was the second straight game as a scratch for defenseman Colin Sullivan, the third in a row for Devin Loe and No. 6 for No. 6, Michael Mooney. 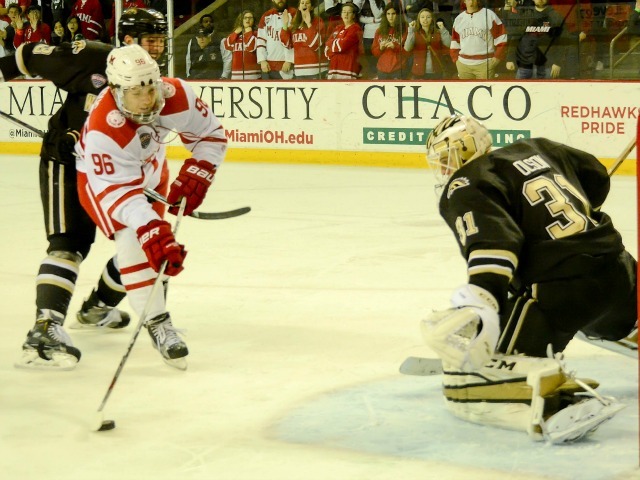 OXFORD, Ohio – It took Miami until the eight-minute mark of the third period to earn its first power play on Saturday. But when the RedHawks finally went on the man advantage, they needed just seven seconds to score the game-winning goal. Miami’s Anthony Louis (photo by Cathy Lachmann). 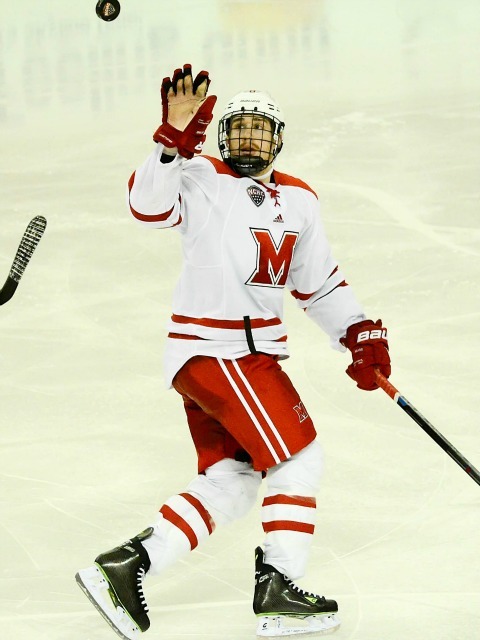 A blast from junior forward Anthony Louis found the net with 8:32 remaining in regulation to lift Miami to a 2-1 win over Western Michigan in the weekend series finale at Cady Arena. 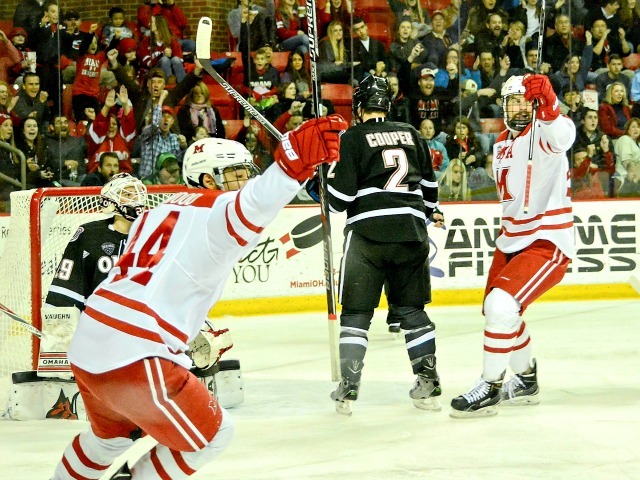 The RedHawks (5-4-1) won by the same score on Friday. Alex Gacek gave Miami the lead with 7:53 left in the first period off a wrister from the high slot. But Sheldon Dries tied the score for the Broncos (4-4-1) just 3:10 later after knocking down an attempted clearing pass by sophomore defenseman Scott Dornbrock, entering the offensive zone and beating RedHawks senior goalie Ryan McKay just inside the far post. 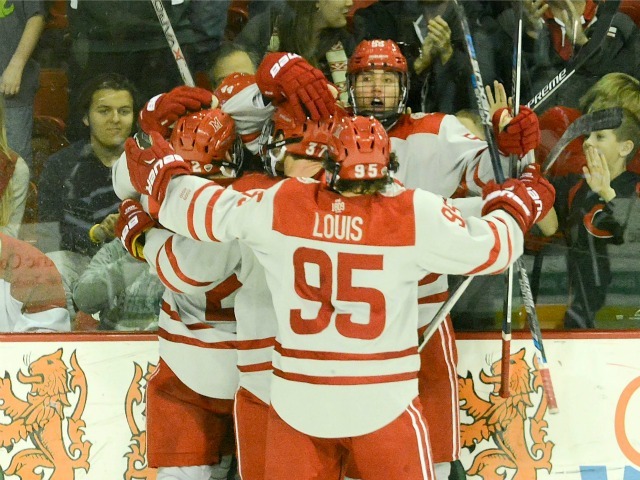 That set the stage for Louis’ game winner, which came off a short lateral pass by senior center Sean Kuraly and appeared to partially deflect off a Western Michigan player in front of the net before finding twine. 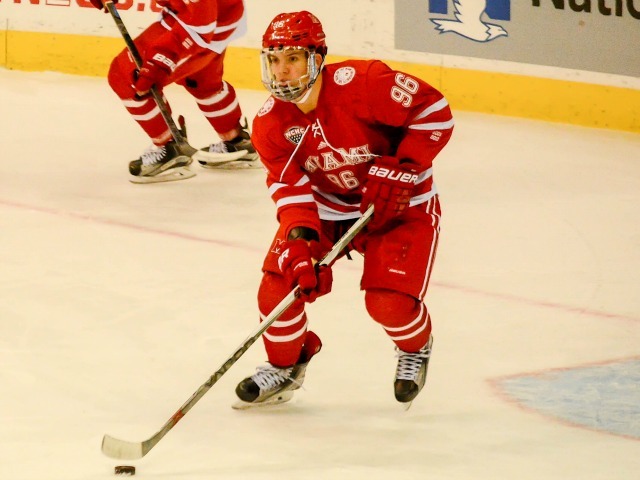 It was the first goal of the season for Louis and the second for Gacek on a team that is in desperate need of offense from sources other than its freshmen phenoms and defensemen. Kuraly picked up two assists, and McKay stopped 19 shots to earn the win, the 34th of his career that ties him for eighth on the team’s all-time leaderboard with Trevor Prior. 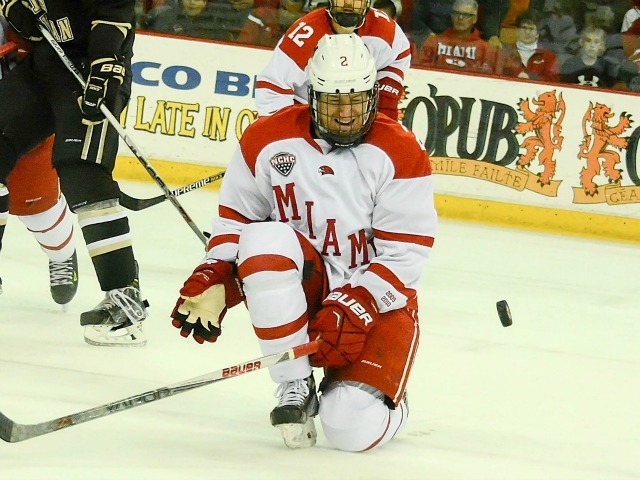 Miami improved to 2-2 in the NCHC, moving into a six-way tie for first place in the conference with six points. After losing on opening night on campus, the RedHawks have won three straight games at Cady Arena and are unbeaten in their last four (3-0-1). Miami will head north for a series at North Dakota next weekend. OXFORD, Ohio – Five minutes in, it looked like a bad Friday night was in store for Miami and its fans. RedHawks senior goalie Ryan McKay allowed a weak shot from Western Michigan’s Paul Stokyewych to slip through his legs for the first goal of the game after Miami dominated play to that point. 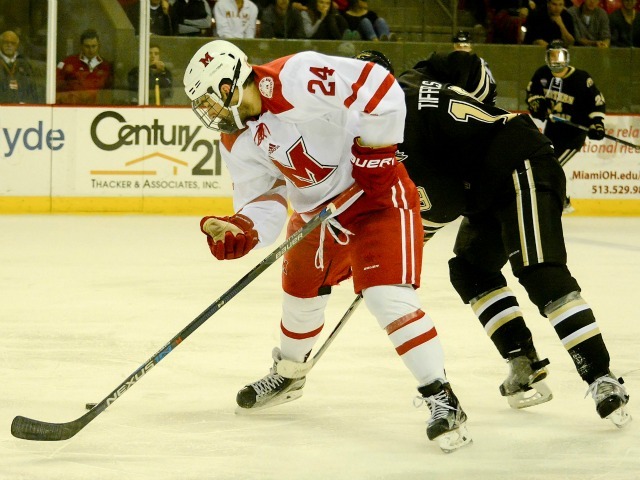 But the RedHawks bounced back from the early deficit to beat the Broncos, 2-1 at Cady Arena. McKay looked shaky through the first period and didn’t appear to see the puck well, but he was an absolute rock the final 40 minutes, especially the last 20 when the team needed him most. And that’s exactly what Miami needs every night right now. Including the two goals tonight, the RedHawks have scored three times in three games and are averaging just 2.00 markers per game. They have not netted more than three in any contest this season. Right now it’s freshmen Jack Roslovic and Josh Melnick and the defense corps, believe it or not, scoring for Miami. That’s it. Think that’s an exaggeration? Forwards not named Roslovic and Melnick have scored a total of four goals through the team’s first nine games and one in the last five. This is not to doom-and-gloom a win, because the offense will get better. 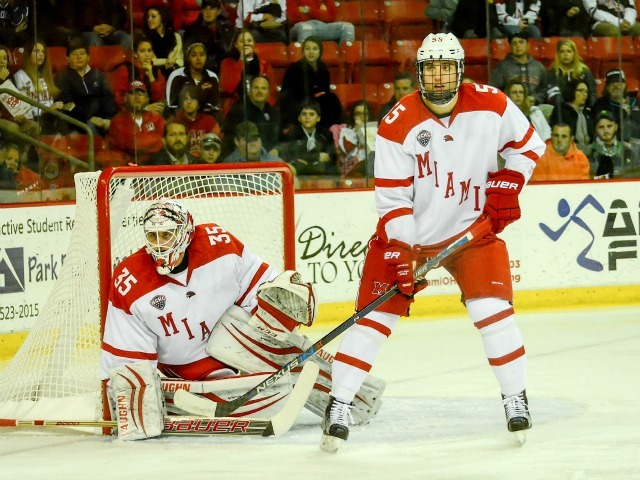 And the RedHawks have a highly-experienced defense corps and senior goaltending tandem who all knew what they were getting into this season with severe losses up front. – For a game with only three goals scored, it was highly entertaining. Miami played great the first period, so well there was almost no need for the Zamboni to scrape the RedHawks’ end after the first intermission. MU played pretty well in the second as well and not as great in the final stanza, but overall deserved this win. – Western Michigan is much better than in 2014-15. This was my first look at the Broncos this season after seeing them play Miami seven times last season, and they move the puck better, play even better defense and have better offensive weapons. The goaltending was also exemplary on Friday. The win for the RedHawks was quality, and a sweep will be difficult to accomplish but meaningful if they do. 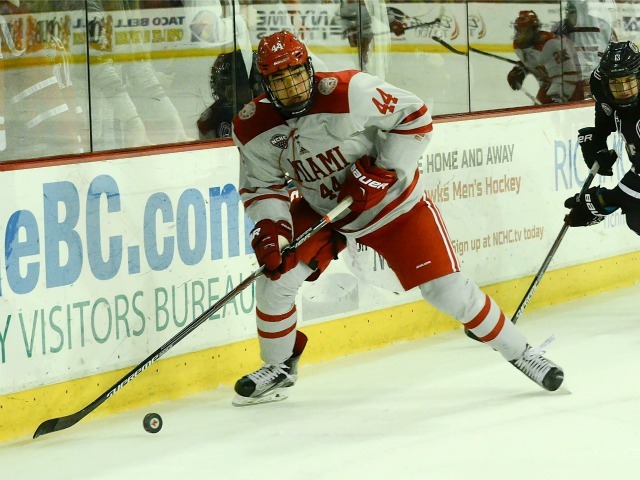 – Miami coach Enrico Blasi is not only shaking up the forward lines but the defensive pairings as well. He broke up top pairing senior Matthew Caito and sophomore Louie Belpedio, possibly because Belpedio hasn’t stepped up from his freshman campaign as hoped and expected. The forward line of Andrew Schmit-Josh Melnick-Anthony Louis played well together, and the Ryan Siroky-Kiefer Sherwood-Conor Lemirande line was also solid despite the former two being freshmen and the latter being a sophomore. – There were just seven total penalties called – two of which were coincidental – in a game that was very physical early with some plays bordering on illegal, so expect another hard-hitting game on Saturday with stickwork and hits that might cross the line at times. – The crowd fell a hair short of 3,000, which is disappointing, but it was a loud group that created a solid home atmosphere. – Friday was the first attempt at a fan tunnel down the hall where Miami’s players come onto the ice for introductions, and we were fortunate enough to participate. This was a very cool concept that is in its infancy and has room to evolve. Certain season ticket holders and some students were chosen to stand right next to red carpet on which the players walk to reach the ice. It appeared to go very well. FORWARDS: B. The two goals scream “here we go again with little offense”, but some credit belongs to the WMU D-corps, which is relentless at getting sticks in lanes, and Broncos goalie Collin Olson, who was 36-for-38. As mentioned above, a couple of line combinations worked really well. Roslovic’s goal was just sick, as no goalie in the NHL would’ve stood a chance to stop it, and the Schmit-Melnick goal was a beautiful thing to watch. It felt like these guys were on the right track, at least for this game. DEFENSEMEN: B+. Neither team had a clear-cut odd-man break until the third period, but Miami had a blueline breakdown on a power play that led to a breakaway (which McKay stopped). It was a makeshift man-advantage unit with Caito and senior Taylor Richart on defense. There was also a point in that frame in which a WMU forward was left completely alone in the slot and fortunately for the RedHawks missed the net with his ensuing shot. It looked like sophomore Scott Dornbrock left his post on that play. But that was it in terms of quality chances. Caito has made numerous obvious shut-down defensive plays recently, and with two seconds left in regulation he went down to block a centering feed that could’ve led to the tying goal. Chris Joyaux is off to a great start to his senior campaign as well and played with Belpedio in this game. GOALTENDING: A-. The first goal was bad, no doubt. But McKay stopped the next 23, including a breakaway to pick up his 33rd career win. His first 20 minutes were a bit shaky, but when he saw more action he got better. It bears repeating: If this team is going to have success early this season it needs strong goaltending in addition to quality defense. For the most part it got both on Friday. Defenseman Taylor Richart (photo by Cathy Lachmann). LINEUP CHANGES: Richart was out for both games last weekend (banged up?) but returned for this game. He’s become a staple on defense and his presence is missed when he doesn’t play. Colin Sullivan was the odd man out on D in this game. Forwards Michael Mooney and Devin Loe both sat for the second straight game. McKay returned to net after senior Jay Williams started the finale in St. Cloud. McKay has played in eight of Miami’s nine games. 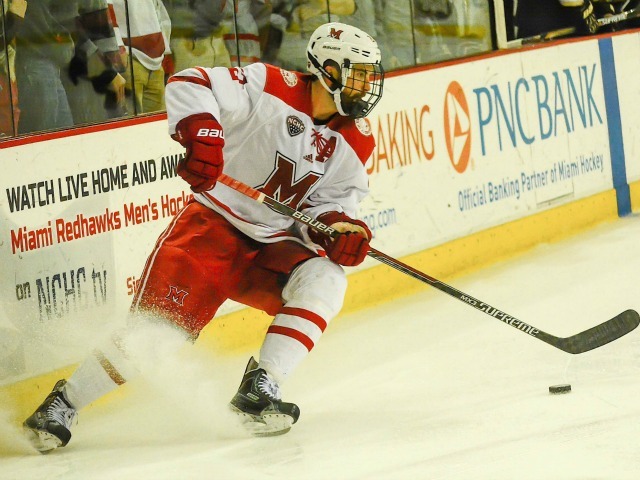 OXFORD, Ohio – Miami’s freshmen helped lead the RedHawks to their first conference win of the season, 2-1 over Western Michigan at Cady Arena on Friday. After Miami (4-4-1) fell behind by a goal early, forward Jack Roslovic tied the score and forward Josh Melnick put the RedHawks ahead, as the team made its one-goal lead stand up. 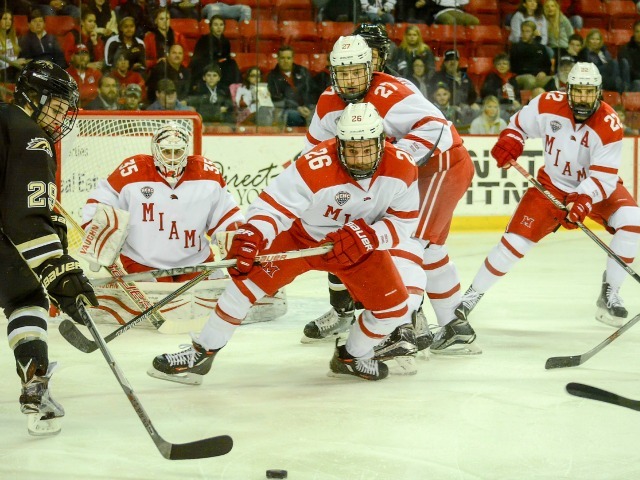 The win snapped a three-game losing streak for Miami, which improved to 1-2 in NCHC play. 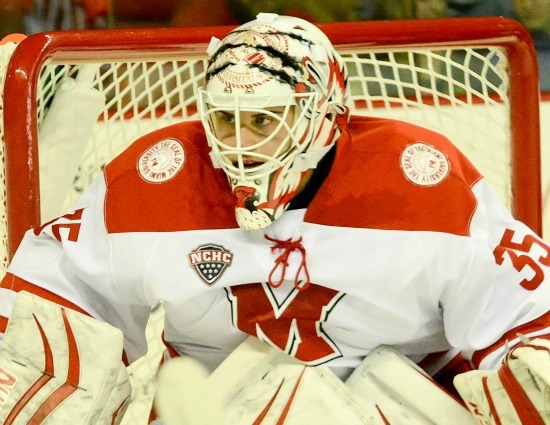 RedHawks goalie Ryan McKay stopped 23 shots to earn the win, but the night didn’t start well for the senior. The first shot he faced from Paul Stokyewych at 4:46 of the first period slipped through McKay’s legs. Just over three minutes later, Roslovic made it 1-1 when he rammed a one time pass from sophomore defenseman Louie Belpedio through the slot just under the crossbar on the power play. Miami’s Josh Melnick (right) scores the game-winning goal (photo by Cathy Lachmann). Melnick slammed home a short pass from senior Andrew Schmit on a rush midway through the second period to put Miami ahead. After seeing just four shots in the first period and eight in the second, McKay was peppered with 12 shots on goal in the final stanza, including a breakaway that he denied by stacking the pads. The shot total was 16-4 RedHawks after one period and ended 38-24 in favor of MU. 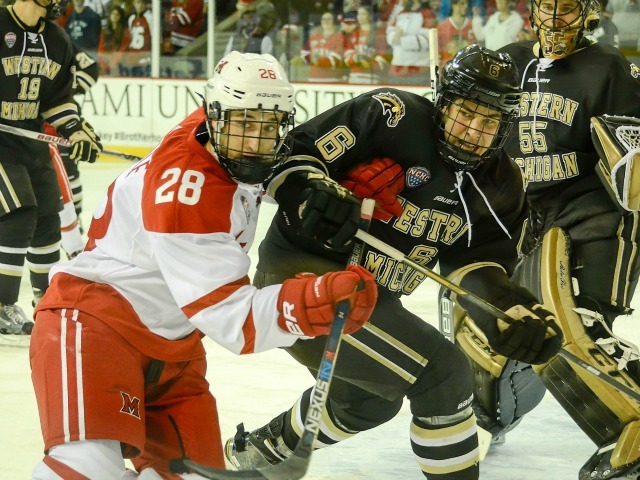 The RedHawks killed both of WMU’s power plays and are now 97.0 percent on the penalty kill (32 of 33), the fifth-best rate in the country and second among teams that have faced at least 10 man-advantage opportunities. Miami junior forward Anthony Louis earned assists on both goals. The goal for Roslovic was his team-high sixth of the season. 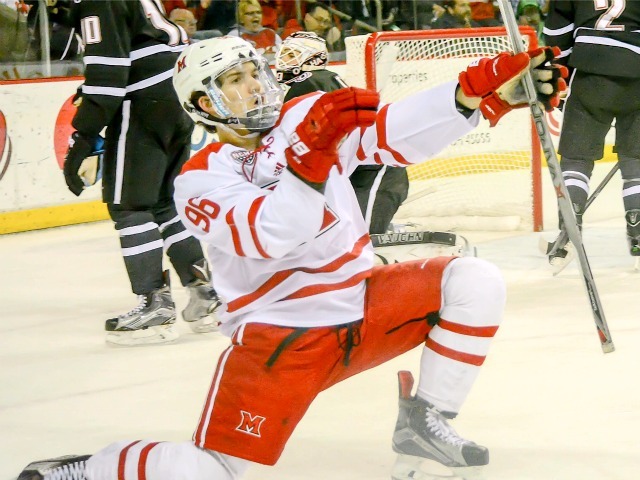 He had the game winners in the first three RedHawks victories, and with Melnick earned the GWG in this game, freshman have game winners in all Miami wins. With the victory, McKay moves into solo control of ninth place on the team’s all-time list with 33, including four this season. He is one away from Trevor Prior, who is eighth on the RedHawks’ career leaderboard with 34. 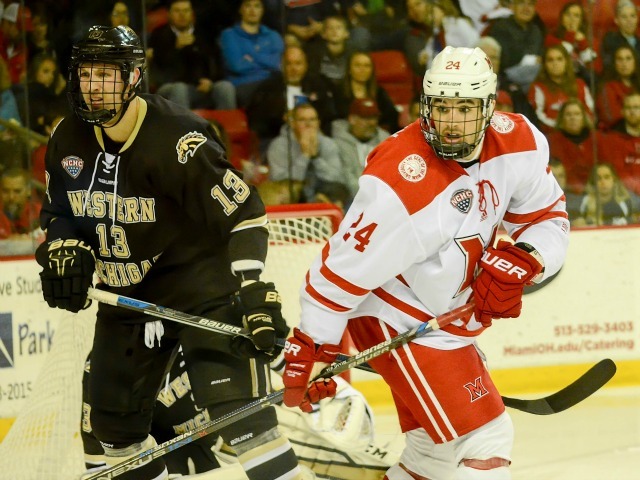 It was the first NCHC loss for Western Michigan (4-3-1), which is still winless on the road at 0-3-1. 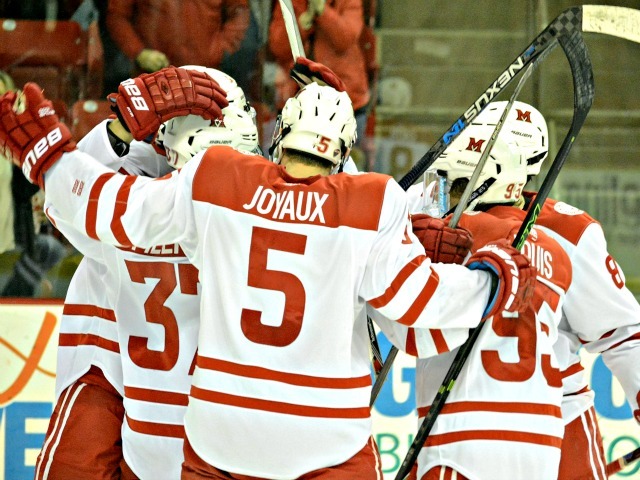 Miami moved into a three-way tie with Denver and Nebraska-Omaha for fourth in the NCHC with three points. The RedHawks and Broncos will wrap up their weekend series at 7:05 p.m. on Saturday.